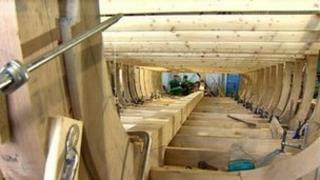 A replica of a historic cargo barge is being built as part of Herefordshire's celebrations for the Queen's Diamond Jubilee. The Wye Trow was a type of working vessel that used to ply its trade along the River Wye. The replica will represent Herefordshire in the Diamond Jubilee River Pageant along the Thames in June 2012. A flotilla of 1,000 vessels will take part to mark the Queen's 60-year reign. Bob Tabor, who is on the Herefordshire Diamond Day organising committee, described it as a "particularly exciting element" of the county's celebrations. "We've carried out extensive research which has allowed us to build the working replica of a River Wye Trow. It really is a case of history coming alive," Mr Tabor added. The timber for the flat-bottomed 36ft-long (10.9m) trow has been sourced from estates in Herefordshire and it is being built in Gloucester. Mr Tabor said: "In the 18th and 19th centuries, these trows would have been built at Hereford and other places along the River Wye. "They would have been used to move cargoes such as coal and wood, cider and wool. They were eventually superseded by the railways at the end of the 19th Century." He said that when the celebrations were over, the trow would be used for education, tourism and art and would highlight the county's heritage. "It'll be a lasting legacy of the Diamond Jubilee celebrations," Mr Tabor said.